In the beauty world, there are two main undertones for foundations — warm and cool. There are countless videos and tutorials online showing you find this out which one you have. But those with olive undertones have a tough time fitting into those categories. One such person was British biochemist Farah Naz, who decided to take things into her own hands and create her own make-up brand. EX1 Cosmetics, which caters to those with olive tones, started off in 2013 and has been used by the likes of Adele and Britney Spears. As the brand officially launches in the UAE on retailer boutiqaat.com, Naz talks to Gulf News tabloid! about how she had to develop her foundation from scratch. Tell us a bit how EX1 Cosmetics started. I was on the quest for the perfect foundation and despite shade extensions, I couldn’t understand why foundations were always either too orange or pink for my naturally olive skin. Research confirmed that I was not alone and that 78 per cent of women are unhappy with their current foundation. In search of answers, I travelled to the home of colour cosmetics: Italy. I visited every lab in the region and what I discovered was alarming. Brands have been using the same orange and pink pigments for years, blending them from light to dark. I decided to start from scratch and created a completely unique blend of pigments designed to be as skin-like as possible. How did your background as a biochemist help the brand? Most foundations are made by chemists. Most biochemists, however, are busy making medicines, as we focus on the chemistry specifically in the body. Not only does this give us the inside intel on ingredients, we additionally understand the impact on skin health. This allowed me to create the highest-quality possible cosmetic formulas on the market that perfectly matched the human skin — and without the nasties. What sets the brand apart from other foundations? Pretty much all brands use similar pigment blends. You can create a range of 200 foundations, but if the base pigments are wrong and don’t match your undertone, you’ll never get a match. Did being a woman of colour influence the brand? Were there any challenges you faced because of it? Knowing my skin tone was underrepresented in the beauty industry was my biggest motivation to innovate. It’s no secret that women of colour get less that 1 per cent of the $85 billion [Dh312.1 billion] of venture capital funding globally and face a slew of other challenges. However, we managed to thrive regardless by making a product that was so good it became impossible to ignore. When you have the likes of Adele, Britney Spears and Justin Timberlake wearing your products, people started to take note. Ultimately, the world will always respect creation. Why should people in the Middle East try your products? Digitally forward make-up enthusiasts across the Middle East saw that EX1 was regularly worn by Hollywood A-listers and supermodels, creating an appetite for the brand in the region. I feel the brand is perfectly suited to the beautiful golden tones of Middle Eastern women who completely fit the premise on which the brand was built. What are your tips for flawless foundation application? Make sure you prep your skin in a way that complements your foundation. If you are using an oil-based primer and a water-based foundation, it will slip off — oil and water aren’t friends. Name a make-up pet peeve. Mixing different brands of foundation to get a better colour match is sacrilege. Foundations are the hardest cosmetics to formulate. They are very fragile emulsions that are incredibly carefully balanced for optimal performance, and then rigorously tested. Each formula is unique, so while mixing may give you a better colour match, in almost all cases it simply won’t function as well. Brands are now being inclusive. Do you think it’s enough or are more efforts needed? We’re definitely headed in the right direction. However, at a scientific level, you can create wide-ranging shade extensions, but if the base pigments are wrong are the undertones aren’t right, you will never find your perfect match. EX1 Cosmetics is now available on boutiqaat.com. 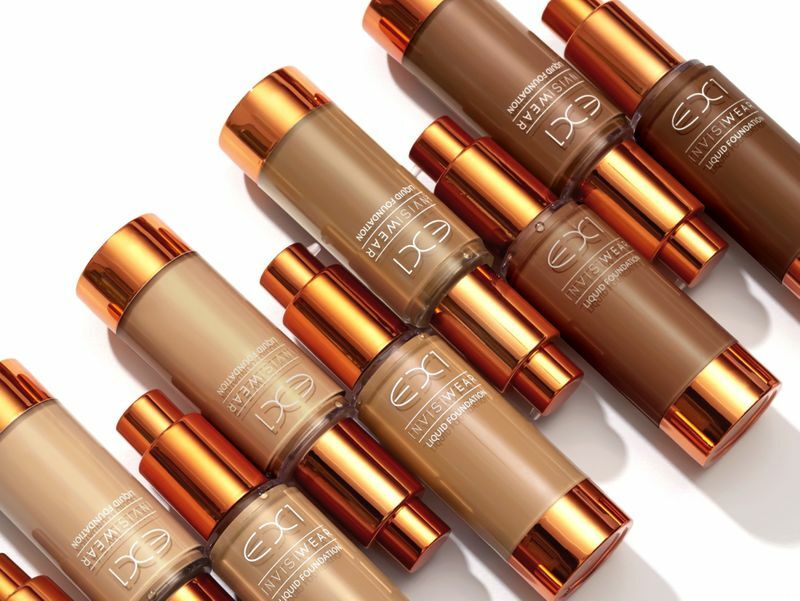 The Invisiwear Liquid Foundation retails for Dh77.